The road between Bury and Haverhill is one of the worst for cyclists. Some of the narrower stretches of it now have a paved footpath at the side, which is a blessed relief after miles of playing the ball in a game of dodge with articulated lorries. 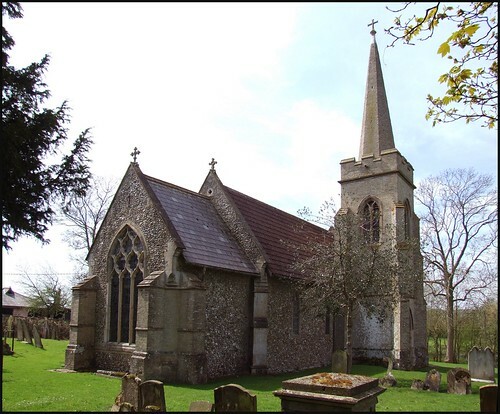 One of the landmarks along the road is this strangely un-East Anglian church in its hill-top graveyard. This is obviously an ancient site, but all around is a wasteland of factories and business units. Chedburgh itself is a pleasant village on the other side of the road, another mile or so further on. There's an excellent pub there. I don't expect too many people regularly walk along the horrid road to get to the parish church, and because of this the church is kept locked, most unusually for this part of Suffolk. However, there are three keyholders listed, and this is a step in the right direction, because when I last came here about ten years ago access was impossible. The keys are at houses in Chedburgh village, but if you are on a bike or on foot then this prospect is perhaps not an inviting one. When I came here before, I could think of almost nothing to say about this church. I am afraid that I described it then as a poor and ugly little church, perhaps because I had found it unwelcoming, or perhaps the weather had not been as beautiful as on this spring day in 2008. Now, I did not see it squat sulkily so much as I had then, but it looked rather charming and even fairy tale-like with its strange little spire. The tower, spire, west end and chancel are all Victorian; only part of the nave is ancient, late 13th century. The church was rebuilt to the designs of William Dudley of Bury in 1842. I'm fond of observing that a locked church is a dying church, but it seems harsh to be too critical of the community here who find themselves with a church on the wrong side of a hellish road. It must be difficult for anyone without a car, especially in winter. Gazing through the windows you can see just about all there is to see, except for what I understand to be some good modern glass in the east window. Directly opposite the south nave windows I could see the war memorial, and even photograph it. At first, I took it to be a roll of honour - how could such a small parish have lost sixteen of its boys? And yet, there they were. Five families appear on the memorial more than once: one, the Souters, is on there three times. What a terrible time for a remote, rural community.